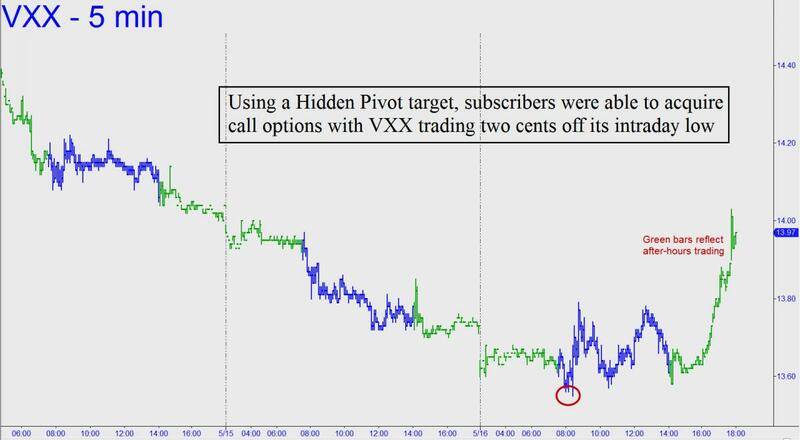 We added to our call position Tuesday when VXX bottomed two ticks off a potentially important downside target at 13.57 that we’d been using for the last week or so to stay out of trouble. This allowed any subscriber who took the trade to buy four June 2nd 13.5 calls two cents above their intraday low of 0.48. We’ll have the wind at our backs if stocks continue to fall overnight, so I’ll suggest offering half (i.e., two calls, or a multiple thereof) of the position to close for 1.00 – twice what we paid — good-till-canceled. If the order fills we’ll hold a virtually riskless position that will have plenty of time to rack up additional gains. We also hold eight May 19th 15 calls in our position that were purchased for 0.50 with VXX falling to a less promising Hidden Pivot target two weeks ago. Continue to offer half of them to close for 1.00. If you don’t subscribe but would like to join great traders from around the world in the chat room, click here for a free two-week trial subscription. You’ll also receive actionable trading ‘touts’ and invitations to frequent ‘impromptu’ sessions where Rick ‘takes requests'.